Learn how to use the new Paint Symmetry feature in Photoshop CC 2019 to easily create fun, symmetrical artwork and designs! Paint Symmetry in Photoshop allows you to paint multiple brush strokes at once to create mirrored, symmetrical designs and patterns. It works with the Brush Tool, the Pencil Tool and the Eraser Tool, and it also works with layer masks. 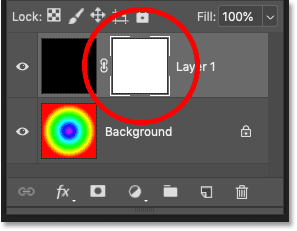 First added as a technical preview in Photoshop CC 2018, Paint Symmetry is now an official part of Photoshop as of CC 2019. All of the more basic symmetry options from CC 2018, like Vertical, Horizontal and Diagonal, are included. Plus CC 2019 also adds two new symmetry modes, Radial and Mandala, that let you create amazing, highly complex symmetrical artwork in seconds! Let's see how it works. To follow along, you'll need Photoshop CC 2019. And if you're already a Creative Cloud subscriber, make sure that your copy of Photoshop CC is up to date. Let's get started! 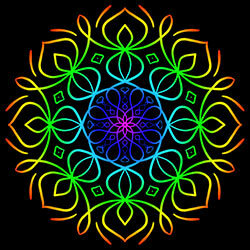 We'll start by learning the basics of how to use Paint Symmetry to create symmetrical artwork and designs. Once we know the basics, I'll show you how to combine Paint Symmetry with layer masks for more creative effects! 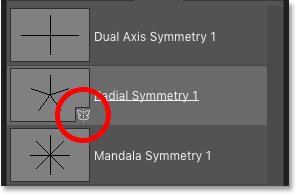 Clicking the Paint Symmetry (butterfly) icon. 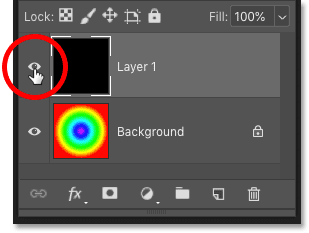 The Paint Symmetry options in Photoshop CC 2019. Vertical: Divides the canvas vertically and mirrors brush strokes from one side onto the other side. Horizontal: Divides the canvas horizontally and mirrors brush strokes from the top onto the bottom, or from the bottom onto the top. 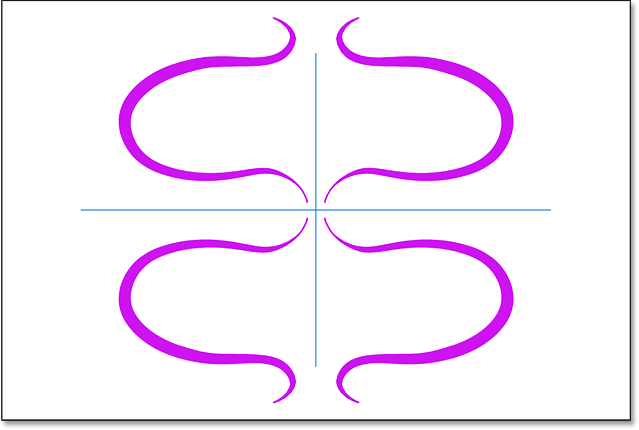 Dual Axis: Divides the canvas vertically and horizontally into four equal sections (top left, top right, bottom left, and bottom right). Painting in one section mirrors your brush strokes in the other three. Diagonal: Divides the canvas diagonally and mirrors brush strokes from one side onto the other. Wavy: Similar to Vertical but with a curved, wavy line instead of a straight line. Circle: Mirrors brush strokes painted inside a circle outside the circle, and vice versa. Spiral: Mirrors brush strokes painted along either side of a spiral path. Parallel Lines: Divides the canvas into three vertical sections using two parallel vertical lines. Brush strokes painted in the middle section are mirrored in the left and right sections. 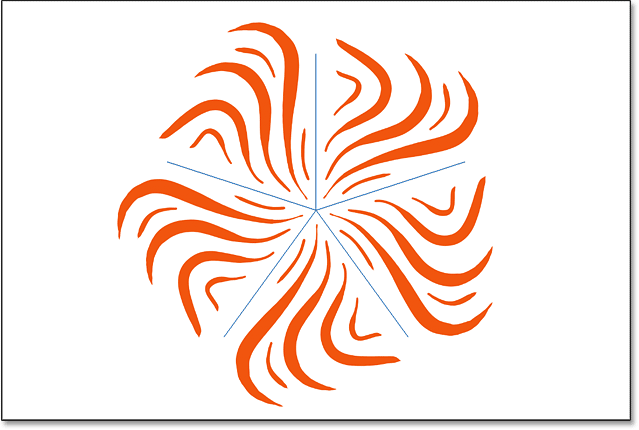 Radial: Divides the canvas into diagonal segments, or "slices". Brush strokes painted in one segment are mirrored in the others. Mandala: Similar to Radial, but mirrors the brush strokes within each segment as well, creating twice as many brush strokes as Radial. Selecting one of the ten Paint Symmetry options. 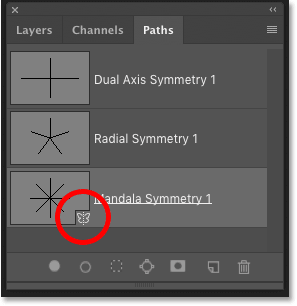 Before you can paint with a symmetry path, Photoshop first places a Transform box around the path so you can scale and resize it if needed. But note that the path is for visual reference only. 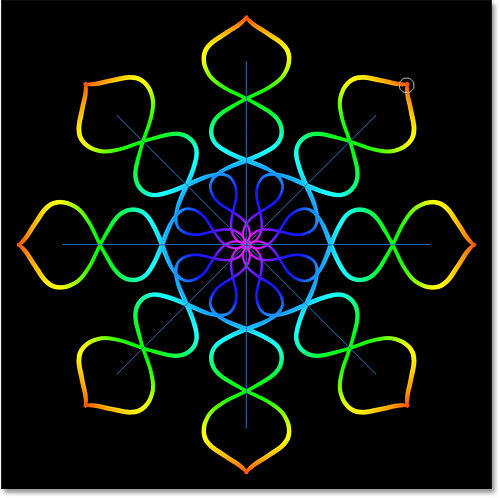 Symmetry paths always affect the entire canvas regardless of the path's actual size. Since painting outside the path boundary has the same effect as painting inside it, there's really nothing to be gained by resizing symmetry paths. So in most cases, you won't need to resize it. Scaling the symmetry path by dragging a corner handle. Clicking the checkmark to commit the path. Painting a single brush stroke creates multiple, mirrored strokes. Painting more brush strokes adds to the symmetrical design. Choosing Hide Symmetry from the Paint Symmetry options. Hiding the path still lets you paint symmetrically. Choosing Show Symmetry from the Paint Symmetry options. Is it art? Probably not, but it was certainly easy. Symmetry paths can be viewed and selected in the Paths panel. 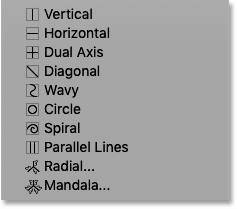 New in Photoshop CC 2019 are two new Paint Symmetry options, Radial and Mandala. Let's see how they work. 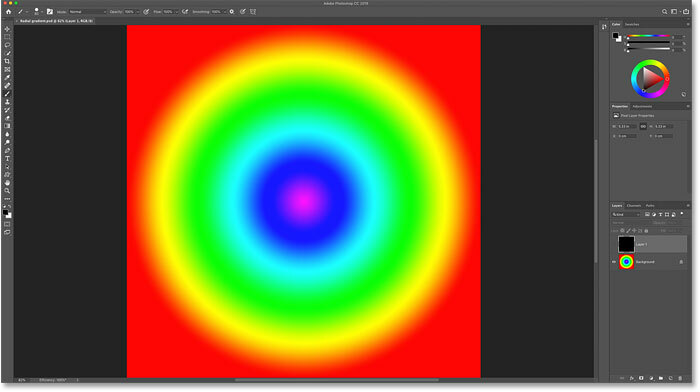 The Radial symmetry mode divides the canvas into diagonal segments, or "slices" (think pizza slices). Painting in one slice mirrors your brush strokes in the others. Choosing Radial from the Paint Symmetry options. Choosing the number of segments to divide the canvas into. Creating a radial symmetry design. 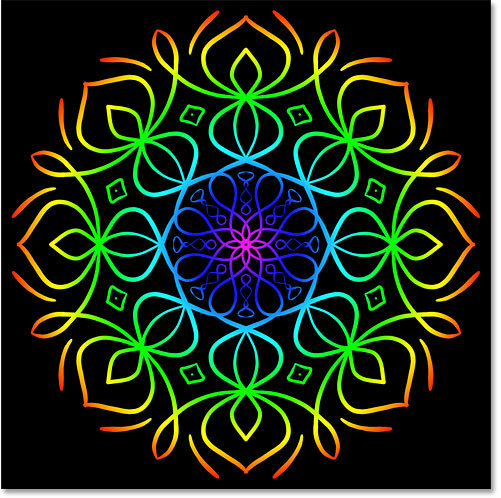 Like Radial, the Mandala symmetry mode also divides the canvas into diagonal segments. 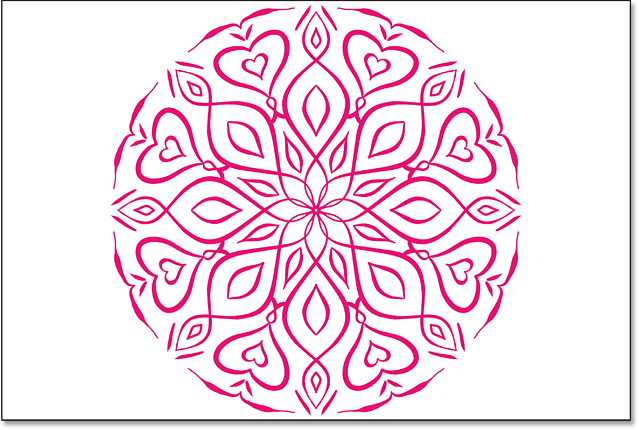 The difference between Radial and Mandala is that, along with mirroring your brush stroke in the other segments, Mandala also mirrors the stroke in the same segment. This adds twice as many brush strokes as Radial, allowing you to create highly complex symmetrical patterns with very little time and effort. Choosing Mandala from the Paint Symmetry options. Choosing the number of segments. 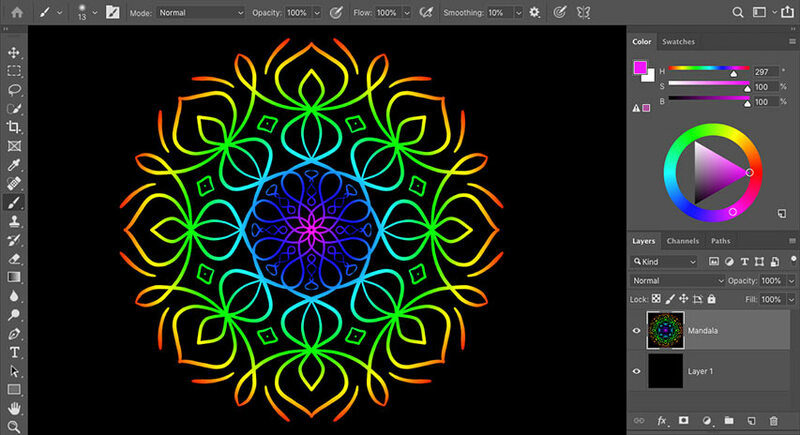 Mandala is the most impressive (and fun) of Photoshop's Paint Symmetry options. 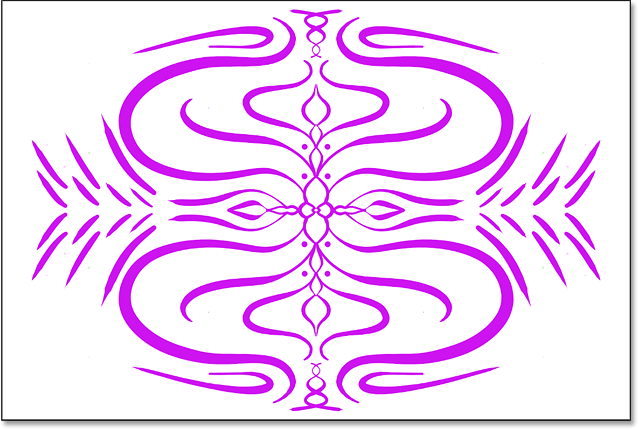 Creating symmetrical designs in Photoshop is fun and easy, but can also involve a lot of trial and error. If you don't like the brush stroke you just painted, you can undo it from your keyboard by pressing Ctrl+Z (Win) / Command+Z (Mac). 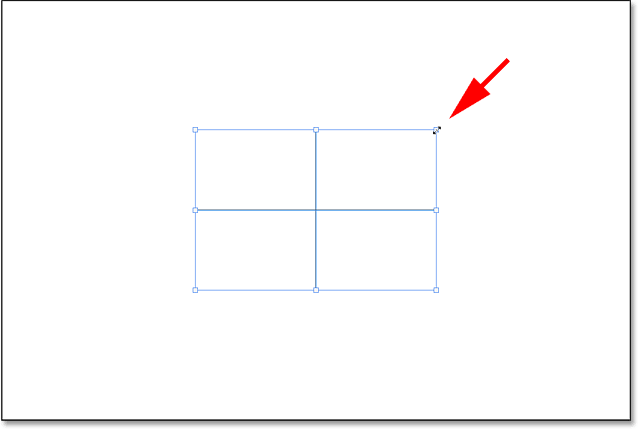 Continue pressing the shortcut to undo multiple brush strokes. 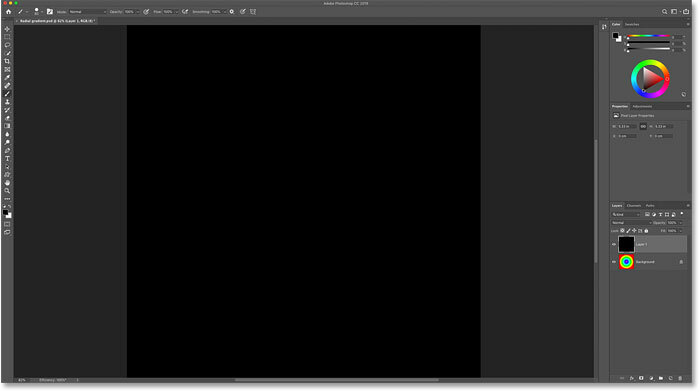 To redo brush strokes, press Shift+Ctrl+Z (Win) / Shift+Command+Z (Mac). The butterfly icon shows the active path. 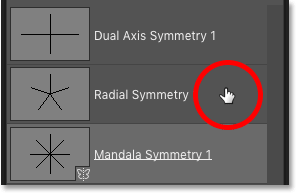 Right-clicking (Win) / Control-clicking (Mac) on the Radial symmetry path. Choosing the "Make Symmetry Path" command. 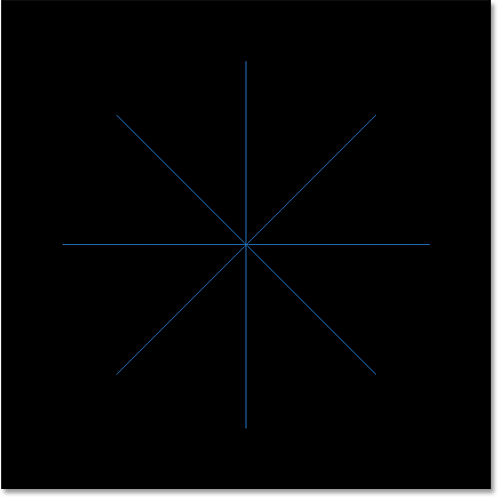 The Radial Symmetry path is now active. Choosing "Symmetry Off" from the menu. 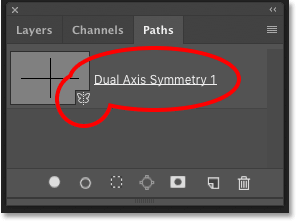 Now that we've learned the basics of how Paint Symmetry works, let's look at how we can use a symmetry path with a layer mask to create something even more interesting. 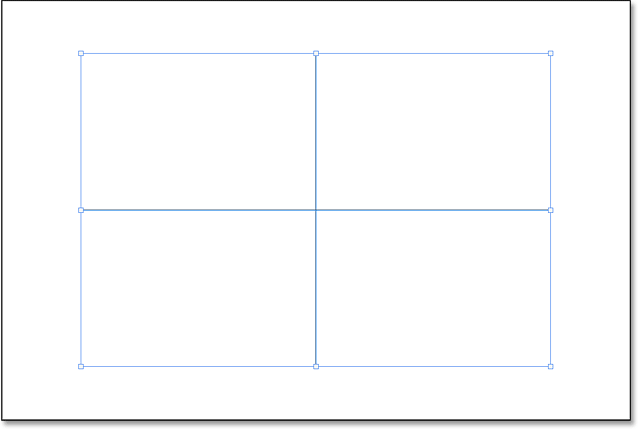 Turning the top layer on in the document. The top layer is now hiding the gradient. Setting the brush color to black. The symmetry path is added to the document. Painting with a symmetry path on the layer mask to reveal the image below. And there we have it! 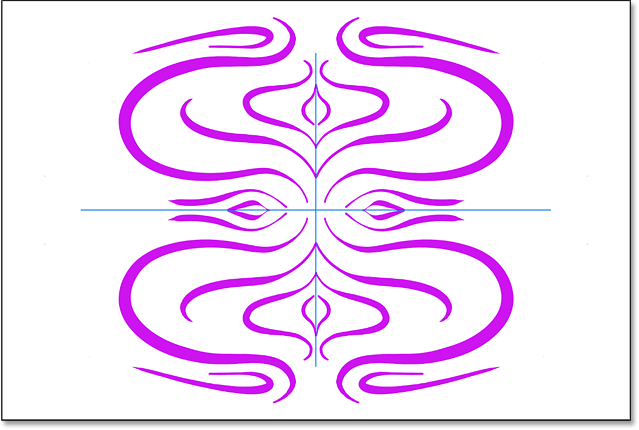 That's how to use Paint Symmetry in Photoshop CC 2019! 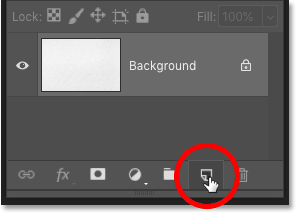 Check out our Photoshop Basics section for more tutorials! And don' forget, all of our tutorials are now available to download as PDFs!